Otherwise known as the Great Yorkshire Chase, this valuable three-mile handicap is often abandoned or run in testing conditions but this year we have genuine good ground for the 11 runners to skip over. Paul Nicholls knows his way around these tough handicaps and in Art Mauresque he has a proper contender once again. He was well beaten behind Charbel twice over shorter than ideal trips this season but they sandwiched a much more important run; his second in the Sodexo Gold Cup in very similar conditions to this back in November and despite a losing run going back eleven outings, he can put his best foot forward here and run close to a place. There have been floods of money this week for Alan King’s runner, one who has more improvement to be unlocked for sure having won easily over this course and distance last season and who hasn’t had these conditions enough in his career to date. That being said, that money is flooding in on a horse who’s been beaten three times on the trot in handicap company and who cannot be described as a shoe-in by any means, so even with good ground to contend with on a track we know he likes he’s not the good thing many have suggested although admittedly we should see a much better run than last time out. Definitely overpriced at the bottom of the weights, Federici has been tried around the Cross Country course at Cheltenham and over the National fences at Aintree recently but it seems a race like this would be much more to his liking. He won nicely 14 months ago at Kelso and perhaps hasn’t had things to his full liking ever since, so a little improvement from that run could see him into the money under Brian Hughes. The best thing to do with this one, despite him having won a Sodexo Gold Cup among other things, is to judge him only on his two chase starts for current trainer Nigel Twiston-Davies. With that in mind, despite the 10yo being on a career high handicap mark now it seems there’s more to be wheedled out of him yet and so having run close to O O Seven in a course and distance chase in December, that horse re-opposing here, the bigger field and faster pace may mean he can cope with his weight and run a solid race. 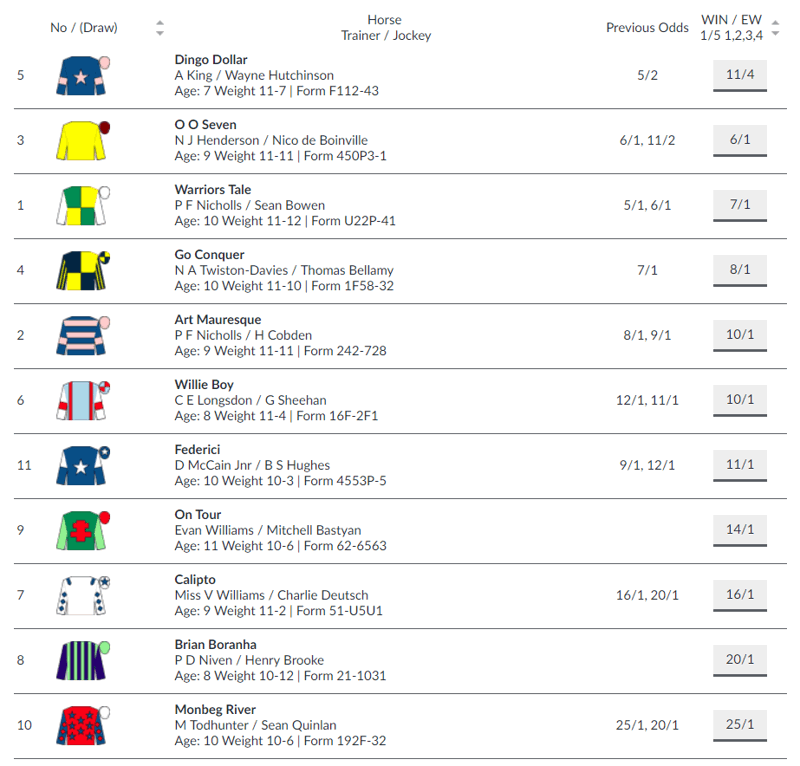 Another Paul Nicholls runner and another with experience, this ten-year-old remains solid and likes it around Doncaster but he would perhaps prefer to be running on softer going in order to show his very best form – the factor that probably just puts us off having a flutter on him in this race. Charlie Longsdon’s yard is in good nick just now and so runners sent from there into big races can at least be expected to run right up to their best. What that may mean for Willie Boy is open to debate given that he’s only had 8 chase races and surely has not reached his peak. With that in mind and in trusting the trainer that this step up in trip will bring him on, Willie Boy can go forward from his very easy recent success at Wetherby over 2m3½f. His best form to date has not been achieved in extreme conditions and so, despite this being run over three miles, the good ground and flat track should suit him down to the ground and a massive run off his mark of 145 looks very likely. There’s no doubting to us that, unfortunately given the incredibly short prices advertised going into the weekend, this Dingo Dollar has a great chance of going close for Alan King and Wayne Hutchinson and we couldn’t put you off throwing him into your placepot. For win purposes though he seems not only short, but not guaranteed to be in love with race conditions all things considered and so the one we like at a very nice price is WILLIE BOY. With the step up in trip thought to suit, conditions to his liking and having had a nice 31 days off between races he just looks hugely overpriced to land this £56,000 pot with Gavin Sheehan trusted to get him home in front.